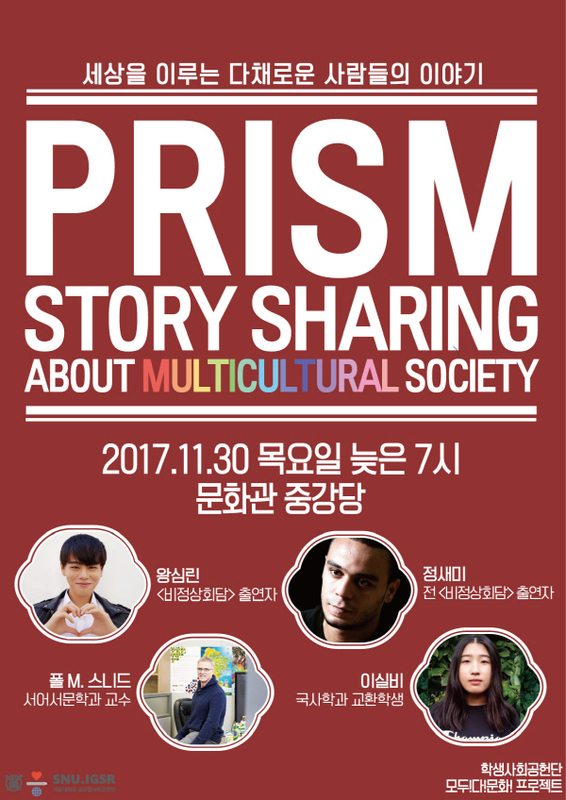 On November 30, SNU students from Student Council for Social Responsibility (SCSR) will be hosting a forum on the topic of multiculturalism. This event is part of a semester-long project carried out by SCSR, a student organization in SNU promoting service to the community. Officially supported by SNU Institute for Global Social Responsibility (IGSR), SCSR strives to make a positive difference throughout the campus community and beyond. In SCSR, students take full initiative, first identifying a significant social issue in the community, and then designing projects that deal with that issue. Most of their projects are carried out within the school grounds. This in turn has the effects of fostering the interests of the other students and encouraging their participation. The organization’s ultimate goal is to help nurture an environment in SNU that values social contribution as much as academic performance. A variety of people in the SNU community each equipped with a wealth of international experience will be on stage, representing a wide diversity of backgrounds. The speakers include: Wang Simlin (cast of “Non-Summit”, PhD candidate in Mechanical Engineering), Jeong Samy (former cast of “Non-Summit,” MA candidate in Korean Language and Literature), Paul M. Sneed (Associate Professor in Hispanic Language and Literature), Sylvie Lee (exchange student from Paris Institute of Political Studies, undergraduate in Korean History). True to its purpose of celebrating individual diversity, the forum will start with the speakers sharing their life stories and an extensive audience-inclusive discussion session will follow. The forum will start at 7PM in the Munhwagwan Auditorium. SCSR invites all to participate.